"Take it one hand at a time." That's the advice most tournament professionals bestow upon those lesser experienced. Every player in a multi-table tournament (MTT) is playing at the same time, against the same sized field, trying to outlast each other and put themselves in a position to go deep. There will be big stacks and short stacks on your table, but really your stack is measured against the entire field. For example, it doesn't matter if you're the short stack on your table in an MTT; check the lobby, and you'll see that there are others worse off than you. So take your time. And take it one hand at a time. That all goes out the window in a Shootout structure. Now, it's a matter of taking it one table at a time. The thing is, you must be the last player standing at every table in order to survive. Your stack is only measured against those five other players as you all start with the same amount every round, so while you still need to play every hand optimally, your tactics change dramatically. This was Event 12-M of SCOOP 2016 - a $215 NL Hold'em 6-Max Shootout event. The field is divided into tables of six, and each plays down to a winner. Those winners then meet at new tables with new equal stacks, and play down to a winner again. The process continues until there are just six players remaining, and at that final table they play down to winner one final time. Today that winner was Germany's Ssick_OnE, the gunslinger who managed to shoot his way through a tough final six to bank a first place prize of $34,400, forging an incredible comeback from just three big blinds to the win. 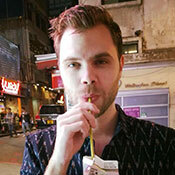 Ssick_OnE already had one SCOOP title to his name - a win in an $82 NLHE Ante Up tournament in 2015 (in which he had a similarly sick run, hence the almost identical blog title). Among the final six here today were Vicente 'vicenfish' Delgado, winner of the $10,300 NLHE High Roller in the 2014 WCOOP for $637,000, and a Supernova player from Russia by the name of hulinada. A total of 1,075 players entered yesterday, and they all took their seats right on time due to the 'no late registration' policy. Team PokerStars had a few deep runs; George Danzer, Felix 'xflixx' Schneiders, Marc-Andre 'FrenchDawg' Ladouceur, and Grzegorz 'DaWarsaw' Mikieleqicz all made the $352.60 money round, as did Kevin 'ImaLuckSac' MacPhee, Paul 'paulgees81' Volpe, Conor '1_conor_b_1' Beresford, Scott 'Aggro Santos' Margereson, Jonas 'donut604' Mackoff, Sebastian 'p0cket00' Sikorski, and €urop€an. Moving into the $1,505 money round, we saw Chris 'BigHuni' Hunichen, Andrew 'RunThisTable' Lichtenberger, and Phil 'philbort' Gruissem all fall before the final table. At the end of the night just six remained, and they returned today to finish this thing off. Sit back and relax as we take you through the action. Ready to sign up for PokerStars and go for your own SCOOP title? Click here to get an account. Graftekkel came out all guns blazing and managed to increase his stack to 15,000 by the second level. There were no huge pots though - another player didn't lose a significant portion of their stack in the process. It happened little by little. The first big hand came in the last hand of that same level, when vicenfish opened to 254 under the gun and Graftekkel three-bet to 825 from the cut-off. vicenfish called and checked, before calling the 820 continuation bet on an A♠J♣T♥ flop. The turn came the 5♦ and Spaniard checked again, but still came along when Graftekkel bet 1,525. Finally the river was the Q♥ and Graftekkel put vicenfish all-in when it was checked to him. vicenfish let his hand go and dropped to 4,282, while Graftekkel increased to 18,818. Then came a string of hefty pots. Ssick_OnE lost the vast majority of his stack in a pot against persephoney, but managed to go from a stack of 691 back to 10,000 thanks to a three-way all-in with pocket Kings against vicenfish's pocket nines and SV(nmgn)EN's pocket sevens (vicenfish picked up the side pot), followed by a bit of luck when his pocket sevens cracked persephoney's pocket tens thanks to a seven on the turn. By the first break, persephoney was the chip leader but the two short stacks had climbed back, and once again it was anyone's game. SV(nmgn)EN couldn't get it going though. He dropped to 4,246 with the blinds at 120/240 and moved all-in from the big blind with the A♣4♥ after Graftekkel's small blind open, who called with the A♦K♦. The 2♠7♥3♠ flop brought hope for a straight, but the A♥ turn and A♠ river gave the pot to Graftekkel and eliminated SV(nmgn)EN in sixth for $5,332. Two hands later and vicenfish was out too. Graftekkel opened to 571 from the cut-off and vicenfish defended his big blind. They saw a Q♠7♣9♠ flop land and after it was checked to him Graftekkel continued for 600, which was called. The turn was the A♦ and it went check-bet 1,200-call, before the Q♦ came on the river. vicenfish then check-called an all-in bet with the Q♣T♦, but his trips was second best to the A♠Q♥ full house that sat in front of Graftekkel. vicenfish banked $8,600, while Graftekkel tied persephoney for the chip lead with 20,000 a piece. From there, Graftekkel began to take over, thanks in no small part to a huge pot won from persephoney. The player from Guernsey opened to 600 under the gun and called a 2,150 three-bet from Graftekkel in the small blind. A 6♣T♣T♥ flop arrived and Graftekkel cotinued for 1,850, which was called, taking us to the 3♦ turn. Graftekkel then opted to check, and persephoney used the opportunity to take a 3,240 stab at the pot, but the player from the Netherlands called. Then, on the T♦ river he'd check again and call a 5,240 bet. It turned out persephoney was being a bit foney with just the J♥K♣, while Graftekkel had a full house with the A♦6♦. After that pot he shot up to 36,542, while persephoney had 8,087, hulinada had 7,833, and Ssick_OnE had 7,538.
hulinada was the next to fall. He moved all-in on the button for 4,953 with the A♠Q♦, but Ssick_OnE woke up with the K♠K♣ in the big blind. The board ran out 4♣6♣9♥2♣J♥ and the Russian hit the virtual rail with $12,900. It was truly a sick run for Ssick_OnE after that as he won the next four pots in a row, one of which was worth almost 12,000, to bring his stack up to 20,000 mark. Persephoney was now our short stack, as rounded-up counts gave him 10,000 to Ssick_OnE's 20,000 and Graftekkel's 30,000. Ssick_OnE began to pull ahead and take the chip lead, swapping positions with Graftekkel as persephoney got shorter stacked. That was until a lucky hand against Graftekkel got him back to 15,000. Graftekkel made it 704 on the button with the blinds at 160/320 and persephoney called from the big blind. The flop was the 4♦9♥3♣ and Graftekkel continued for 675 when it checked to him, but persephoney then moved all-in for 6,824 and was called. He had the Q♦4♥ which was the trailing the A♦9♠, but another four on the turn secured him a double up and made Graftekkel the player most at risk. The flying Dutchman's downfall came not long after. With the blinds at 200/400, persephoney made it 1,111 to go from the small blind and Graftekkel three-bet to 3,200 from the big. Persephoney then jammed all-in with more than enough to cover him, and Graftekkel called off for 11,226 total. persephoney was ahead with the 9♠9♥ against the 8♥8♣ but the 9♣A♣3♣ gave Graftekkel a better shot despite having his opponent make a set. Any club would do it, but the turn was the 4♥ and the 6♦ came on the river. Graftekkel went flying out of this tournament, but the player from the Netherlands collected $19,350 for third. Stacks were similar going into heads-up play, but two big hands changed it all. First, persephoney made it 1,300 on the button and got a call, before the 2♥J♣T♣ flop fell. Ssick_OnE check-called a 1,200 c-bet and the T♦ hit the river. He then check-called a 2,400 bet, taking us to the 3♠ river. Ssick_OnE checked again and persephoney bet 5,445 which was called. persephoney had just the Q♥7♥, so it was a good call by Ssick_OnE with the 9♠J♦. That gave him 40,000 to persephoney's 20,000. Both had paired their ten on the flop, but with the King kicker Ssick_OnE's was bigger. The 7♠ on the river changed nothing, and this one was all wrapped up. persephoney banked $25,800 for his runner-up finish. A sick come back and a sick win for Germany's Ssick_OnE, who is your latest SCOOP champion and the winner of $34,400. Let's see how he gets on throughout the rest of the SCOOP - taking it one tournament at a time.